An e-Lessons is a private lesson from the comfort of your own home. These lessons are the future of private instruction because the hitter can get quick feedback, a video of their swing to study, and parents are able to use the video analysis to help their hitter by learning advanced hitting concepts and our "Tribe Terminology". Plus, you'll receive a specific drill, along with a video demonstration, to address your player's mechanical issues. Coach Nick uses Square Cash to accept payments, an easy-to-use and secure system. 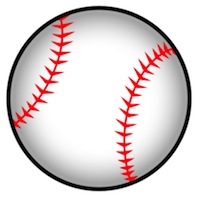 Click the baseball below to send your video and payment - all in one e-mail. 1. The link above will create a new e-mail from your default e-mail account. If you don't have a default e-mail set up, just log in to your personal email and send your video as an attachment to winwithinbaseball@gmail.com and CC cash@square.com. The subject of the email will be the amount you will pay, $30. Be sure to include your ballplayer's name in the body of the email. 2. Once you send the e-mail, Square Cash will e-mail you requesting your debit card number (3% additional charge on credit cards). 3. Once you press send, you're all done. Your fully analyzed eLesson will be delivered to your inbox in less than 72 hours. 4. Work on your swing! "Nick is a testament to the importance of effort and class. One of the hardest working and best teammates to ever don the Kenyon uniform, Nick, through tireless effort, turned himself into an All-Conference and All-American player. His leadership skills were also very evident as he was voted team captain during his playing days with the Lords. A consummate "pro," Coach Sussman is now responsible for mentoring our young baseball players; I can't think of a better person for the job." "Virtual lessons are the next frontier of baseball instruction. Remote video lessons through video analysis are a quick, effective way to rapidly improve instruction and stay connected to your instructor. It's as simple as pointing and recording on an iPhone, attaching the file on an email, and then receiving your video. Nick is the perfect coach to lead your ballplayer into this new and exciting baseball environment." "For our baseball-loving son, Coach Nick's video e-lessons have been a revelation. Sure, our ballplayer has been to baseball practices, clinics, and camps, all of which provide excellent training. But here, he was able to watch his own swing, slowed down and broken down by Coach Nick, and hear Coach Nick's clear suggestions for adjustments, as well as coach's affirmation of what he was doing correctly. Our son watched the marked-up video several times and even took notes, then immediately went to try out the adjustments as well as the coach's suggested drills. Using the video analysis has helped our ballplayer take responsibility for his own progress and understand that improvement is not something that just happens to you, but rather, is the result of a deliberate effort to watch and correct your technique." Please email winwithinbaseball@gmail.com with any questions.